Here is the quilt. 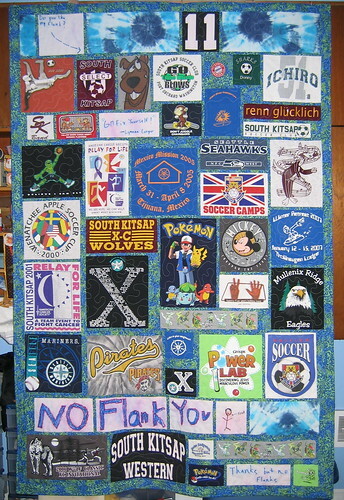 A graduation quilt for my good friend's son made from his t-shirts. The most amazing thing about it is that I am about 3 weeks early getting it done - that is pretty much unheard of around here! 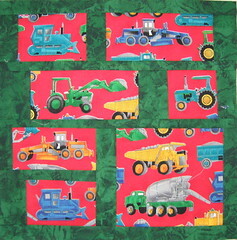 Once the machine quilting on that was done I got busy with some other commitments. 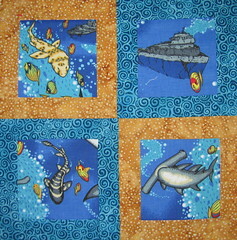 Here are three blocks for a flickr quilt block exchange started up by my daughter. Check it out - you might want to be a part of our group. 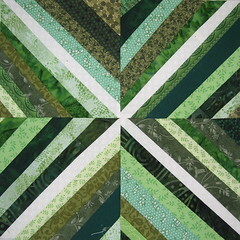 I also got 2 blocks made for another block exchange I am involved in with my sister. There are 12 of us in that group and we will each make one block for each of the other people. We are hoping to be done and have a reveal sometime this summer. Then I will be able to post pictures. My final block for today is this little one. 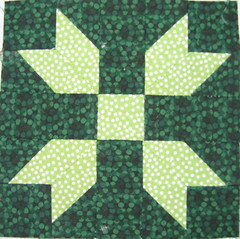 It is 5.5" square and will be part of a drawing in the Mini Quilt In a Bag group on flickr. Everyone who is a part of the swap is making a block and then one of our names will be drawn at the end of the month and all the blocks will be sent to that quilter. Another group project is a quilt my Tuesday evening crafting friends and I are doing for a 'yet to be determined' charity. We are all making 6.5" spool blocks. I have had so many other things going I haven't gotten any made so I started cutting out some blocks from my scrap drawers. I got 12 blocks cut out and have started on the sewing but my feet and legs were telling me I need to sit and get my feet up. There is always tomorrow. My final commitment going on right now is Spring Fling Round Robin 3. I might get that done this week too if I put my mind to it!